A magnetic monopole is a particle that has only one magnetic pole (a north pole without a south pole or a south without a north). This particle is still hypothetical and is considered an isolated magnet because of its properties. In more technical terms, this particle would have a net "magnetic charge". Theories such as the Grand Unified Theory and the Super string theory predicts the existence of magnetic monopoles but its existence is still inconclusive. Effective (non-isolated) magnetic monopole quasi-particles exist in some condensed matter systems such as Spin Ice. A spin ice is a substance that can never be completely frozen. It is similar to iced water or water ice. It has this property because it does not have a single minimal-energy state. This is called geometric fractionalization or frustration. A spin ice has "spin" degrees of freedom (i.e. it is a magnet), with frustrated interactions which prevent it freezing. Existence of deconfined magnetic monopoles in these materials were gathered from experiments. It was shown to behave with properties similar to the hypothetical magnetic monopoles postulated to exist in the vacuum. Minimal evidence of a Higgs transition 1 of north and south poles of electron spins was observed in a magnet Yb2Ti2O7 at the absolute temperature 2 0.21 K. A fractionalization of these monopoles from electron spins was observed on cooling to 0.3 K. On further cooling below 0.21 K, the material showed the ferromagnetism to be understood as a superconductivity of monopoles. The work is reported in an online science journal "Nature Communications" in UK on August 7, by an international collaboration team of Dr. Shigeki Onoda (Condensed Matter Theory Lab., RIKEN Advanced Science Institute), Dr. Lieh-Jeng Chang (Quantum Beam Science Dictorate, Japan Atomic Energy Agency and Dept. of Physics, National Cheng Kung Univ. ), and Dr. Yixi Su (Jülich Center for Neutron Science JCNS-FRM II, Forschungszentrum Jülich), and coworkers. Figure one shows the pyrochlore lattice structure of spin ice and spins on a tetrahedron. The left shows Pyrochlore lattice structure. Each lattice point (red) hosts an electron spin. The right shows Directions and configurations allowed for spins located at vertex points of the unit tetrahedron of the pyrochlore lattice structure. Electrons rotate like the earth, acting as tiny magnets called spins in magnetic materials. Usually, these spins form a magnetic order on cooling, and the monopoles, namely, north and south poles of electron spins, are confined to each other. In magnetic materials called spin ice 3, the spins remain unordered even at low temperatures, and the monopoles behave as if they are fractionalized while unstable. Since 2010, on the other hand, Dr. Onoda and coworkers have predicted a so-called quantum spin ice 4 that can exhibit a magnetic order realized by a Bose-Einstein condensation of monopoles. In this case, a coupling to fictitious electromagnetic fields, called gauge fields, endows a mass for otherwise gapless spin excitations in the ordered state, forming an analogous superconducting state of monopoles via the Higgs mechanism5. Now, cooling a quantum spin ice material Yb2Ti2O7 to 0.21 K, the team observed a transition from a state with fractionalized unstable monopoles to a ferromagnetic state with condensed stable monopoles, indicating a Higgs transition of monopoles. This state hosting dissipationless monopole current of spins is expected to play important roles in spintronics that aims at efficient controls of magnets for application. In most of electrically insulating magnets, electrons form tiny magnets called spins by their rotation. A macroscopic number of spins usually show an order at low temperatures, demonstrating a spontaneous symmetry breaking. For instance, in ferromagnets and antiferromagnets, spins show parallel and antiparallel alignments, respectively. However, a geometrical frustration, which will be explained below, sometimes suppresses a formation of the magnetic order, as in materials called spin ice, Dy2Ti2O7 and Ho2Ti2O7. Spins in spin ice are localized at points of a pyrochlore lattice which has a network of corner-sharing tetrahedra (Fig.1, left). Each spin can point only to the "in" or "out" towards the center of the tetrahedron. Two adjacent spins interact with each other so that they form a pair of "in" and "out". However, it is impossible that all the pairs of adjacent spins on a tetrahedron take such pair of "in" and "out" (Fig.1, right: black lines). Because of this frustration, the four spins on each tetrahedron are compromised to form a "2-in, 2-out" structure, as the most stable one (Fig.1, upper right). This is called the ice rule. Yet a huge number of spin configurations satisfy the ice rule over the crystal, preventing a spin ordering even at low temperatures. Inverting a single spin in the ice-rule state creates a pair of unstable "3-in, 1-out" and "1-in, 3-out" tetrahedra hosting a north pole and a south pole of spins at the center, respectively (Fig.1, middle right). These north/south poles are recognized as monopoles fractionalized from electron spins, whereas they are unstable and disappear eventually. In 2010-2012, Dr. Onoda and coworkers derived a theoretical model called "quantum spin ice" for magnetic materials like Pr2Zr2O7 and Yb2Ti2O7, where monopoles exhibit a motion obeying the quantum mechanics. It has been shown that in certain cases, monopoles undergo a Bose-Einstein condensation leading to a magnetic order where each spin points to a direction largely tilted from the "in" or "out". 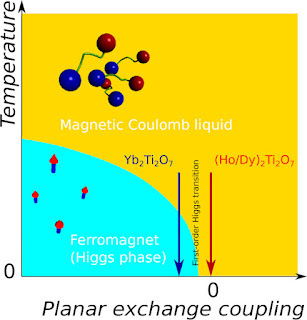 Now the collaboration team, cooling a quantum spin ice magnet Yb2Ti2O7, challenged an observation of a transition, from the state with fractionalized but unstable monopoles, to the other having condensed monopoles. This shows the neutron-scattering intensity map at 0.3 K. The left shows experimental result on Yb2Ti2O7. The middle shows the theoretical results based on the quantum spin ice model. The right shows a map for conventional magnets slightly above a magnetic transition temperature. The research team irradiated a neutron beam on the single crystal of Yb2Ti2O7 with the neutron spins being aligned, and then analyzed configurations of electron spins from a pattern of the scattering intensity of neutrons by electron spins. First, the correlation among electron spins was measured at the absolute temperature 0.3 K (Fig.2, left). The result remarkably agrees with a theoretical calculation based on the quantum spin ice model (Fig.2, middle). It reveals such a ridge structure that the scattering intensity strongly depends on the scattering direction, unlike a peak structure to be observed around a transition temperature in conventional magnets (Fig.2, right). This indicates that monopoles become fractionalized from electron spins slightly above the transition temperature in Yb2Ti2O7. Below 0.21 K, a typical scattering pattern indicating a magnetic ordering and a total loss of the polarization of the neutron spins were observed, confirming that the material becomes ferromagnetic. It was also found that at 0.03 K, much lower than the transition temperature, ordered spins pointed to directions that were largely rotated from the "in" or "out" allowed for spin ice. This structure of spin ordering coincides with the theoretical calculation on the same quantum spin ice model at absolute zero temperature. These observations point to a transition due to the quantum-mechanics acting on monopoles, from a magnetic Coulomb liquid where monopoles interact with each other through a Coulomb force analogous to the electric Coulomb force, to a ferromagnetic Higgs phase where the monopoles are condensed (Fig.3). The superconductivity showing zero electric resistivity is used for application. The ferromagnetism in quantum spin ice reported here is expected to provide the spintronics, aiming at efficient controls of the magnetism for device applications, with a new state that can carry monopole current of spins without loss. Quantum spin ice materials, if the Higgs transition temperature is increased to a room temperature, may open a revolutionary industrial engineering. The figure is a schematic phase diagram of quantum spin ice. Spin ice materials, Ho2Ti2O7 and Dy2Ti2O7, (a red arrow) are considered to behave as a classical Coulomb liquid and the quantum nature of spins can be ignored. A quantum spin ice material Yb2Ti2O7 (a blue arrow) undergoes a phase transition to ferromagnetic Higgs phase because of a weak quantum nature of spins. In the magnetic Coulomb liquid regime, north poles (red balls) and south poles (blue balls) behave as fractionalized but unstable particles. In the ferromagnetic Higgs phase, north and south poles become stably condensed, tilting spins from the “in” and “out” (red arrows with blue bars). The mechanism in which fields and particles coupled to gauge fields obtain a finite energy (mass in spontaneously breaking a continuous symmetry and undergoing a Bose condensation. It was proposed in 1964 by a physicist P. W. Higgs in UK. Later, in 1974, it was incorporated by S. Weinberg and A. Salam as well as S. Glashow to the Standard Model for particle physics, as the mechanism in which matters obtain masses. In condensed-matter physics, a physicist in US, P. W. Anderson, independently proposed in 1963 that the superconducting transition is described by the same mechanism. The temperature describes the amplitude of thermal motions of molecules, atoms, electrons, and so on, and has the lower bound. This is called absolute zero temperature, 0 K (Kelvin), which corresponds to －273.15 ℃ in Celsius. The Kelvin has the common temperature scale with the Celsius. Water ice having a cubic symmetry has the pyrochlore lattice structure where each lattice point is shared by two tetrahedra. An O2－ ion is located at the center of a tetrahedron, while an H＋ ion is slightly displaced from a pyrochlore lattice point (a vertex of a tetrahedron) because it forms a hydrogen bonding with either of two neighboring O2－ ions. The displacements of four H＋ ions in a tetrahedron take a "2-in, 2-out" structure, namely, two point inwards to and the other two point outwards from the center of the tetrahedron. This is called the ice rule. There are six different configurations of satisfying the ice rule, and a macroscopically large number, , of configurations if the number of H＋ ions is given by N.
Suppose that the way of H＋ ions forming the bonds is replaced with that of electron spins which can point only either inwards or outwards. This is realized in magnets Dy2Ti2O7and Ho2Ti2O7 and they are called spin ice. In spin ice, each electron spin is only allowed to point to the center of either of two tetrahedra to which the vertex point of the spin belongs, namely, the spin can take either of two states "in" and "out". On the other hand, when spins can point to any other directions rotated from "in" and "out", it turns on additional interactions which can flip the two states of neighboring spins, because of the quantum-mechanics. Such system is called quantum spin ice. The probability of finding particles obeying the quantum mechanics fluctuates in space and time, as in the case of waves or fields. Fermi and Bose particles are typical quantum-mechanical particles, on which the exclusion principle acts and does not, respectively. In particular, in the case of Bose particles, a macroscopic number of particles can occupy a certain single stable state. This is called a Bose-Einstein condensation. Once it occurs, a quantum-mechanical phase describing its wave nature is fixed by a spontaneously symmetry breaking.